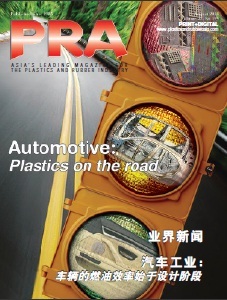 Fibre-reinforced plastics/composites are considered to be materials with enormous potential, including considerable potential for development in a wide variety of applications. They can be used, for instance, in the automotive industry, in construction, in aviation and in electronics. Many sectors of industry and areas of application are developing ever new uses for these versatile, young materials. 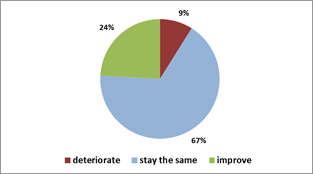 Following trends in previous surveys, the current economic situation is seen as positive by the respondents. However, whereas in the last survey nearly 90% viewed the economic situation as “quite positive” or “very positive”, this share has gone down to just over two thirds of all respondents. The downturn was to be expected after the very high level in previous surveys. Once again, the situation is seen as particularly critical in Europe, whereas it is generally rated as better for Germany and on a global scale. The positive assessment of the general economic situation and the good future prospects are underpinned by several further factors. Nearly 30% of respondents are planning to recruit new staff in 2015, compared with only 10% who are planning to downsize their workforce. An equally good picture emerges for planned investments, as nearly two third of respondents are hoping to make investments this year. Likewise, a strong commitment to the composites market continues to be seen as worthwhile. 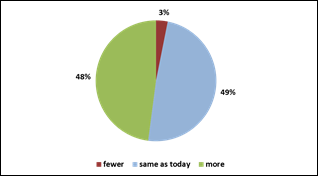 Nearly half of all correspondents say they are hoping to step up their commitment to composites (Illus. 2). 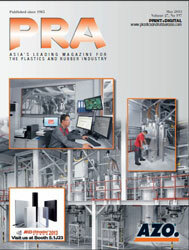 As before, the main impetus for growth in this survey is believed to come from CFP (carbon-fibre reinforced plastics). 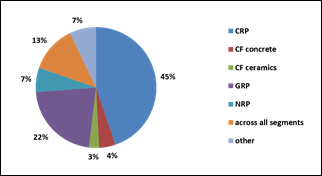 When asked which future growth drivers they perceived on the material side, nearly half of all respondents specified CFP (Illus. 3). The regional drivers in this segment are seen to be Germany and Asia. For the first time the survey also covered the respondents’ assessment concerning future developments in different areas of application. The automotive and aviation industries are apparently expected by the composites industry to display the most positive development, followed by wind energy. Both the general economic situation and the companies’ own business situations are seen by respondents as somewhat more negative than in previous surveys (Illus. 4). However, it must be emphasised in this context that levels were extremely high in previous surveys. Yet despite this slight downturn, the assessment of the economic situation generally continues to be positive (see above).